A few words from Nann: In 2014, I reacquired full rights to three of my already published books with the intention of republishing them under my own brand, Golden Keys Publishing. 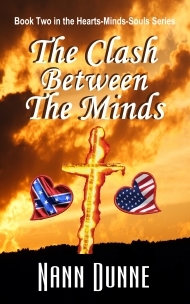 Staying in the Game, The War Between The Hearts, and The Clash Between The Minds have all been republished. The stories are the same, but I've given them new covers, and I own all the rights to those books. If you didn't get to read them the first or second time around, take a look at their descriptions and grab them if they appeal to you. Enjoy the stories! I've also listed the cover for The Peace Between the Souls, Book Three in the Hearts-Mind-Souls Series, that is currently a work in progress. Look under the My Books tab (above) for my other available books. Is the aloof and mysterious Shelley Brinton involved in the murder of coeds in the campuses surrounding Spofford College? 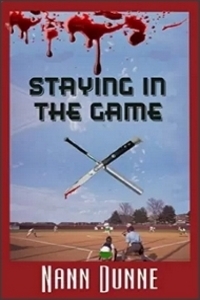 She keeps disappearing at night, and her softball teammates suspect she's the killer. When Angela Wedgewood enlists their help to prove Shelley's innocence or guilt, startling revelations put Angela in direct line to be the next victim. What dark motives drive Shelley Brinton? Not everyone is who they seem to be. Click HERE for YouTube Trailer. 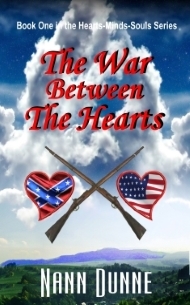 The War Between the Hearts, in its original printing, was short-listed for a Goldie Award from the Golden Crown Literary Society. Intent on serving the Union Army as a spy, Sarah-Bren Coulter disguises herself as a man and becomes a courier-scout for the Confederate Army. Soon the savagery of war shakes her to the core. She stifles her emotions so she can bear the guilt of sending men, and sometimes boys, into paths of destruction. When Sarah is wounded and in danger of dying, her life is saved by a woman who stirs desire in Sarah for the first time. But Faith Pruitt is Sarah's enemy, and Sarah is betrayed into a hell worse than she has ever known. Sometimes hearts are killed instead of bodies. Can Faith save Sarah's heart and awaken her to love? Do they even want to try? Or are the women destined to be at war with each other forever? The Clash Between the Minds, in its original printing, was short-listed for a Goldie Award from the Golden Crown Literary Society. The book also won second place in the Rainbow Romance Writers of America Awards. New version not yet published. Coming soon. Watch for it! Sarah-Bren Coulter, her partner, Faith Pruitt, and Faith's son, Benjamin, are faced with rising turmoil in their community. When Sarah and Benjamin become embroiled in the violence, Faith is appalled by Sarah's actions and by the obvious dangers those actions pose for her family. Terrified by their involvement in the horrific events, Faith wavers. Should she stay with Sarah and continue to risk Benjamin's life? Or should she accept the safety and protection of marriage to the town's doctor? Tormented by that possibility, Sarah struggles to save their relationship and keep her family intact. Will Sarah regain her family? Can the two women overcome the clash between their minds and prevent a permanent separation? Tired of living a lie, Sarah-Bren Coulter informs her family that she and Faith Pruitt are in a committed, intimate relationship. She's unprepared for the reactions from her mother, Cynthia, and her brother, Scott. Ironically, Fate intervenes, and Sarah and Faith open their home to Sarah's parents and to Scott's family. Sarah's struggles to win acceptance by her family are interrupted when the henchmen of an old nemesis, Dr. Joel Litchfield, kidnap Scott's daughter, Jessica, as a hostage in the aftermath of a bank robbery. With the sheriff immobilized, Sarah jumps in to rescue her. How will Sarah's subsequent actions affect her family? 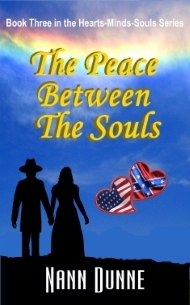 Will they come closer together, or will the violence that results rip them farther apart? Will she and Faith ever find peace? Copyright © 2015 Martinenza Associates. All Rights Reserved.